AMYTT is a 200-hour teacher-training program that provides immersion into a lifestyle of inner joy and universal love. Our training program teaches yoga as a transformational tool for spiritual awakening and betterment of the human society. This inspiring and comprehensive yoga training will deepen your personal practice and give you the tools to teach yoga to others. Graduates of AMYTT receive internationally recognized certification. AMYTT is certified by Yoga Alliance for the 200-hour standard for Registered Yoga Schools (RYS). 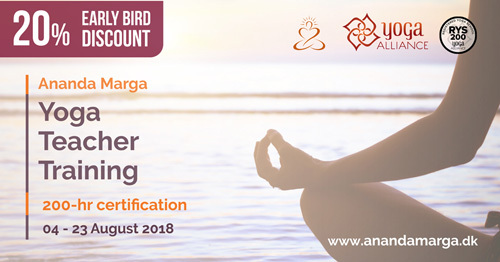 The AMYTC program is open to yoga students of all levels, providing all participants with a strong foundation in yogic practices and philosophy from the Ananda Marga Tantra Yoga tradition. Experienced and professional faculty facilitate a strong and supportive learning environment that integrates postural yoga with anatomy, physiology, philosophy, cosmology, subtle anatomy, and effective teaching methods. Dada Vishvarupananda, MSc, E-RYT 200, RYT 500. Dada has been a monk in the Ananda Marga tradition for over 27 years and has given personal instruction to numerous aspirants during that time. Dada has received additional training with Ananda and Kripalu, and has a Master’s degree in Yoga Therapy. He has been teaching professionally since 2000 including college credit classes at George Washington University. He has facilitated numerous retreats and yoga teacher training programs throughout the world. Dada is a senior monk of Ananda Marga with 40 years experience teaching meditation and yoga around the world. Dada is currently the head teacher and program coordinator at Ananda Gaorii Ashram in Denmark and hosts a long running and popular meditation course at the Ananda Marga center in Copenhagen. Every day promises a full schedule with a comprehensive curriculum that includes plenty of opportunities for multi-dimensional learning and hands on teaching. Ananda Gaori is located in rolling farm land that provides clean air, inspiring views and healthy walks. Accommodation includes dormitories, and grassy fields for camping. Participants should bring their own sheets, sleeping bag, etc. Those who need more privacy and peace (and loud snorers) are encouraged to bring their own tent and camp. To register you must pay the advanced booking fee (750 Dkk) or the full amount and then fill out the registration form (see link below). The full amount must be paid no later than July 20. The advanced booking fee is non-refundable. Cancellations prior to July 20 will be refunded the amount paid minus the advanced booking fee. Cancellations after July 20 will be refunded by half the amount. Acount name: Ananda Marga DK Kurser/Courses. **NB! Please include the words “Yoga Teacher Training” in the message line. Loose fitting yoga pants or track suit pants for yoga, swimsuit for the beach, hat for outdoor activities, sweater or jacket for early morning cool, indoor slippers, own towel, toothbrush, etc. own sleeping bag, notebook, walking shoes, small daypack or knapsack, own yoga mat if possible. Ananda Gaorii is an Ashram – a place to focus on spiritual development. So we kindly request everyone to wear modest clothing. For men this means no short shorts, and not walking around without a shirt. For women this means no short shorts or skirts, no low cut blouses. Loose fitting yoga pants and T-shirts/shirts with sleeves are preferred rather than the tight fitting yoga pants which are common these days. By car the address is: Holbaekvej 56, 4560 Vig. Drive time about 1 hour from Copenhagen. By train the station is Vig. Travel time from Copenhagen is 1 hour and 40 minutes with one change at Holbaek Station. (You can also take bus 260 from Holbaek Station – cost and travel time are the same and your ticket is good for train or bus). Those of you coming from outside Europe may require a visa to enter Denmark and some of you may need an invitation letter from the Prout Convention organizers before you can get a visa. If you send an email with your name, address, nationality and passport number to Vishva Shanti at obrekke@commediaschool.com he will send you an invitation letter.